Topics: - Apprenticeships, - Diplomas, - Foundation Learning, Facilities, Gallery, and How To Apply. It is hosted by Community Internet Plc (England, Kidlington,) using Apache/2 web server. 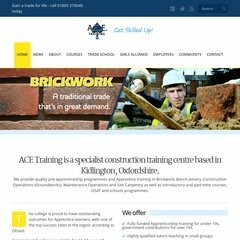 A-c-e-training.com's server IP number is 195.72.163.66. Its 2 nameservers are dns01.community.net.uk, and dns02.community.net.uk. PING d1.s2.web.ci-net.com (195.72.163.66) 56(84) bytes of data. Pinging the server, resulted in a 99.9 ms response.